Simon Pride has won the Scottish Marathon Championship four times representing three different clubs in the twenty first century at a range of venues and has a remarkable record over all the endurance distances from10K to 100K. What follows was in the main written by Fraser Clyne with additional information from Colin Youngson. Simon Pride was born on 20th July, 1967 in Swansea. he represented Wales in 800m and 1500 metres as a youngster and was in the same schools international team as world champion hurdler Colin Jackson. His promising running career took a back seat after he left school to join the Army at 17. Four years later he moved to Fochabers in Moray, Scotland where he settled with his wife Linda and took a job as a roofer and sheet metal erector. Running remained a casual but enjoyable pastime until a frightening and nearly catastrophic industrial accident changed Pride’s outlook on life. He explained “One day a nail was fired through my thigh bone just above the knee. It was probably the turning point as I thought my running days could well be over. Not only did the incident make me change jobs (he became a postman), at also shook me up into a training frenzy. For too long I had taken my running for granted. Within four months I had won my first GB vest. Pride found international success in the world of ultra distance running. His first 100K in 1996 produced a Scottish championship bronze medal. The following year he was ninth in the European year and by 1998 he had a top six finish in the World Championships to his credit (6:59:38. 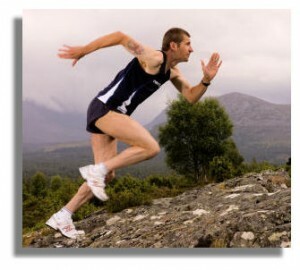 Simon benefited from the wisdom of world 100K record holder Don Ritchie who lived relatively close by in Lossiemouth. The Keith and District athlete’s greatest triumph came in May 1999 in France where he won the world title with a UK road best of 6 hours 24 minutes 05 seconds. It was a superb performance which took the ultra-marathon world by surprise. Even more surprising was Simon’s decision a year later not to defend the world title. “I need a break from ultras” he said at the time. He decided to concentrate on marathons for a while and when the opportunity for a Scottish title on his home patch presented itself, Pride was in no mood to miss out. He was determined to win the Scottish title in 2000 – and equally keen to break the course record of 2:25:38 set eight years earlier by Fraser Clyne. he achieved both with plenty to spare. Running on is own for almost the whole way he took advantage of the perfect conditions to stop the clock in 2:21:17. It was the quickest winning performance in the championships since 1984, the biggest winning margin ever and just14 seconds outside his personal best set in London four months earlier. In 1998 Simon won the prestigious, and sadly missed, Two Bridges Race (35 miles 495 yards) from Dunfermline over the Kincardine and Forth Bridges finishing in Rosyth. His time was three hours twenty nine minutes. Simon always maintained not only endurance but also speed in his training – long mile intervals with short recoveries, and tempo runs or fartleks, often on undulating forest tracks. After winning North of Scotland Road and Cross Country titles and placing in the top ten at Scottish Cross Country championships, as well as personal bests for 10K and marathon in his build up, in March 1999 Simon Pride came close to breaking the world record for 40 miles track when winning the well respected annual event in Barry, Wales, with a time of 3:53:55 which was a race record. This was a key part in the preparation for his amazing achievement on 15th May 1999 when, as Adrian Stott wrote, “He stormed to the gold medal at the IAU World 100K Championships at Chevennes-en-Paillier in France. Living only a few miles from Don Ritchie in Moray, Pride had been inspired and guided by the training and racing attitude of his illustrious compatriot. In an exciting last 10K he prevailed over the Frenchman Thierry Guichard by a mere 21 seconds! His time is still a Scottish (and GB) record.” later Simon received the John Jewell Medal for 1999 which is presented annually by the Road Runners Club for the most outstanding annual road running performance at any distance from 10K upwards by a British athlete. In addition he was Scotland’s Athlete of the Year. Simon’s concentration from 2000 onwards on the marathon distance paid dividends. He recorded an excellent personal best of 2:16:27 in the 2001 London event and represented his adopted country, Scotland, in the Manchester Commonwealth Games marathon in 2002 finishing sixteenth. After a brief return to ultra running when he finished third in the 2004 European 100K Championships in Faenza, Italy, Simon’s running reverted once more to shorter distances. Marathon victories include Belfast, Dublin, Lochaber and the Loch Ness event. he was Scottish Marathon Champion four times, in 2000, 2001, 2004 and 2006 (variously representing Keith, Metro Aberdeen and Forres Harriers). In addition he has won umpteen 10K’s, 10 milers and half marathons as well as the M35 title in the Scottish Masters Cross Country Championships. Simon Pride is talented, versatile, brave and tough and his finest achievements (all as a Scotsman) have been absolutely outstanding.